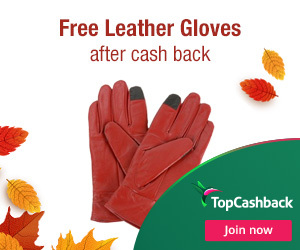 Unfortunately the "Free Women's Touch Screen Leather Gloves" offer is no longer available. These Women's Touch Screen Leather Gloves will provide warmth while being thin to insure gloves don't feel bulky. Makes the best holiday gift for the stylish techie in your family, friends, or workplace. 3. Add one (1) Women's Touch Screen Leather Gloves priced for $9.99 to your cart and checkout. Do not add anything else to your cart. 5. In about 14 days $9.99 will post in your TopCashback account. Offer valid through February 11, 2018.